These are just some of the questions that intrigue Brigid Tierney, one of the astute members of the Canadian delegation in Peace it Together’s 2011 dialogue and filmmaking program. “I think art is one of the only honest ways of holding dualism – the good and the evil, the everyday and the extraordinary,” says Brigid, who spoke recently with Peace it Together after spending months researching and writing on the topic for her master’s degree in communications and culture. Unlike other traditional storytelling forms that can reinforce tired narratives and stereotypes about people in conflict zones, Brigid says art can be a way to link seemingly disparate people in unexpected ways. “Art asks you to think not just about warring groups, but about the relationship between them,” she said. 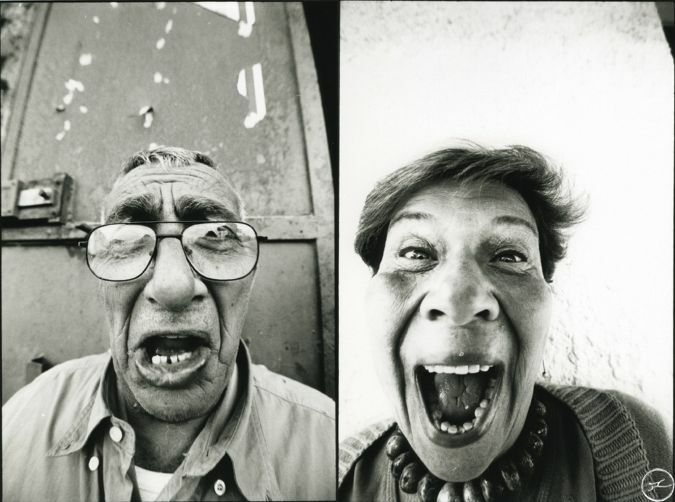 The Face2Face project by artist and 'photograffeur' JR does just that. 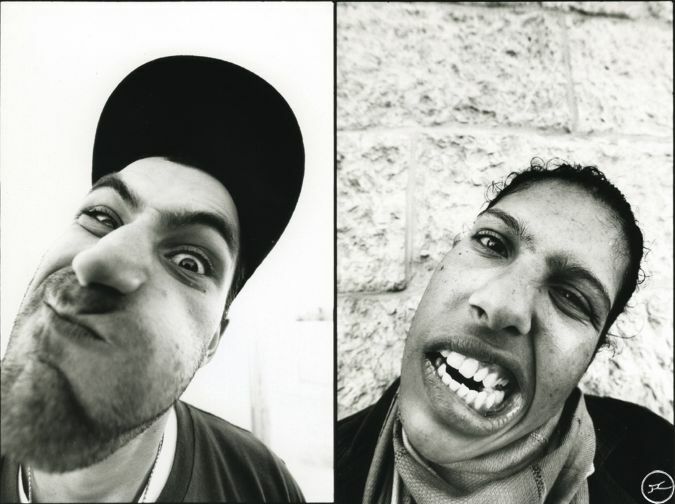 Shown throughout the streets of Israel and Palestine in 2006 and 2007, this exhibit - what the artist describes as "the biggest illegal photo exhibition ever" - juxtaposed larger than life, close-up portraits of Israeli and Palestinian faces, twisted into zany expressions. The project was a focal point for Brigid in her research. Artist JR's project, Face2Face. 'Separation Wall Detail, Security Fence, Palestinian Side, 2006' (www.jr-art.net). The subjects of these photos were grouped in pairs according to profession: religious leaders side by side, hairdressers shoulder to shoulder, teachers two abreast, a Palestinian and an Israeli each. Their images were blown up and plastered in public places where you could not help but notice them: along the Israeli side of the separation wall in Abu Dis; on the Palestinian side of the wall in Bethlehem; on buildings in Ramallah and Jerusalem; even on billboards in Jericho. Public artwork like JR’s has the ability to capture people’s attention says Brigid, whether they are running errands, driving on a highway, or out with friends. Film can do this too, says Brigid. And she would know. Brigid co-created the film In the Presence of Absence with Chen Cohen (an Israeli) and Ansar El-Refai (a Palestinian), as part of Peace it Together’s 2011 dialogue and filmmaking program. Participating in Peace it Together helped Brigid to do the kind of art she found so fascinating; art that challenges divisions, stereotypes, and polarization. What Tierney also finds fascinating about JR’s Face2Face project is the way he plays with strict notions of identity. The way JR succeeds at muddying people’s assumptions about who’s who in this intractable conflict, while simultaneously demonstrating how similar the two sides really are, is part of what makes this project powerful. 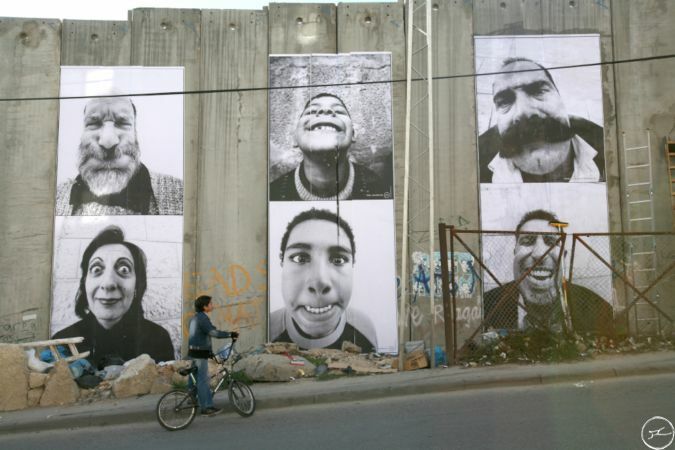 So should we see pictures of Israelis and Palestinians making silly faces as a form of protest? What do photos and films that capture a different narrative about Israel and Palestine, say about peace? “No one is saying, ‘This is peace,’” said Brigid. Brigid Tierney recently earned a Master of Arts degree in communications and culture, through a joint program offered by York and Ryerson Universities. She lives in Toronto.